Re: Another bug in JK2MV? I assume the filename on your server has got a space in it. The original jk2 download system didn't support spaces in filenames and as we maintain legacy compatibility jk2mv doesn't support spaces either. Or perhaps this map is blacklisted by server admin? I think in that case jk2mv doesn't reference the file and the client won't attempt to download it. I think it's a space in the file name, something like "Chicago Streets.pk3" and the client tries to download "Chicago.pk3" from the server, cause the filename gets sent over with the spaces and the client considers spaces to be seperators between files. We definitely don't have it blacklisted and the map works for those who downloaded it by other means. And the space in filename..? Hm.. 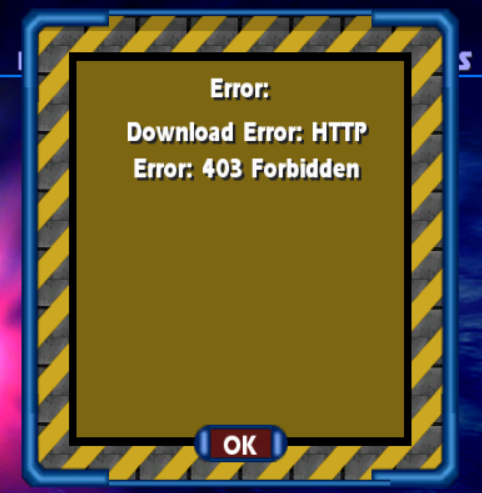 In HTTP the error 403 means the file is forbidden by the server (or where is stored), if you are the hoster you should check the file or folder permissions. Anyways check if the file has the same name in the base folder. for example if the file is "Chicago.pk3" in the download reference list should be name exactly "Chicago.pk3", if is "chicago.pk3" with lowercase maybe you will have a problem. Removing the space in the pk3 filename fixed the issue, so it didn't have to do with their permissions, but more the issue Daggo pointed out.